Ok, I know - here's another train station, but I can't help myself! The first step to knowing you have a problem is to admit it. So, I have a problem, folks. I love train stations. I am addicted to shooting them, especially in Europe. I make every effort to shoot whichever ones I pass through on my travels. I can't help it. Aren't they cool? 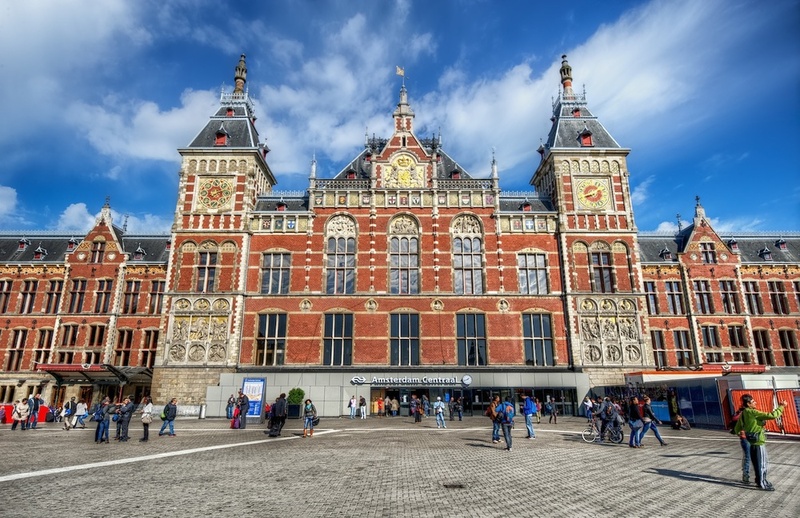 This is the facade of Amsterdam Centraal Station, which as the name implies is their big central terminal. And it's big! The facade is quite beautiful as you can see, but on my last two visits the interior was under such construction that there is not a grand lobby or central interior space to shoot (yet). I'm not sure, but there might be one and it's just hidden. If anyone knows, please let me know. So I have had to satisfy my shooting addiction here by concentrating on the exterior. And heck, it's so awesome that's ok with me! I also grabbed quite a few shots from the train platforms, and will have to find some time to work on those. But still this facade is the main draw for me, photographically speaking. The only downside was that I never made it here at sunrise or sunset, choosing instead to focus (no pun intended) on other spots during those times. So maybe next time I will get there during the edges of the day. I look forward to a return visit - it's a great town to wield a camera in!